Habit: Plant strongly perennial herb, stout. Stem: lower main 0.8--3 mm diam. Leaf: fleshy; 0--2+ per axillary cluster; stipules 4.5--11 mm, +- conspicuous, narrowly triangular, dull white to tan, tip long-acuminate. Inflorescence: simple or 1--3+ × compound or flowers 1 in axils; glandular-hairy. Flower: sepals fused 0.5--1.8 mm, lobes 4.5--7 mm, in fruit < 8 mm; petals white or pink to rosy or blue; stamens 9--10; styles 0.5--3 mm. Fruit: 4.6--10 mm, 0.8--1.4 × calyx. Seed: +- red-brown, generally winged; smooth, tubercled, or sculpture worm-like or of low rounded mounds, not papillate. Habit: Plant 10--30 cm. 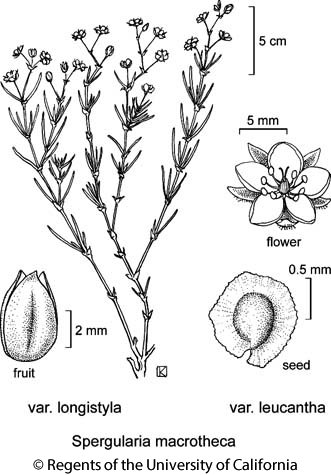 Flower: calyx lobes (4.5)5--5.5 mm, in fruit < 7 mm; petals white; styles 2--3 mm. Fruit: 0.8--1 × calyx. Seed: 0.8--1.2 mm. Citation for this treatment: Ronald L. Hartman & Richard K. Rabeler 2012, Spergularia macrotheca var. longistyla, in Jepson Flora Project (eds.) Jepson eFlora, http://ucjeps.berkeley.edu/eflora/eflora_display.php?tid=66607, accessed on April 26, 2019. No expert verified images found for Spergularia macrotheca var. longistyla. NCoRI, GV. Markers link to CCH specimen records. Yellow markers indicate records that may provide evidence for eFlora range revision or may have georeferencing or identification issues. Purple markers indicate specimens collected from a garden, greenhouse, or other non-wild location.